May’s labor market reports served up a lot to get your mind wrapped around. Johnson City unemployment rate dropped to 2.9%, and the rest of the area saw rates below 4%. 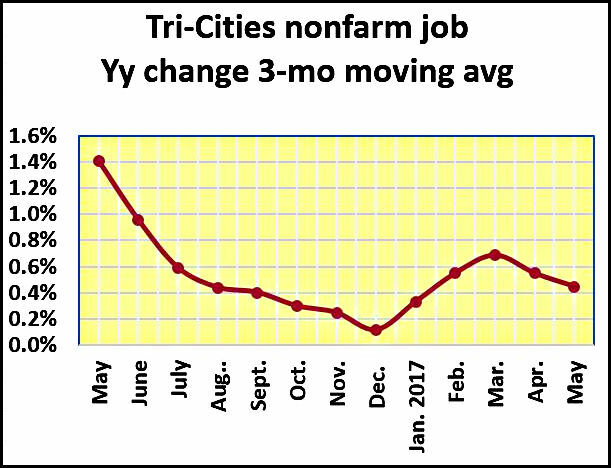 It was the second month of decades low jobless rates and another signal that the seven-county Tri-Cities region may have reached its new normal. But the best thing to hold onto when looking at those unemployment rates is they are preliminary, non-adjusted numbers and by themselves not the best metric of the labor market. 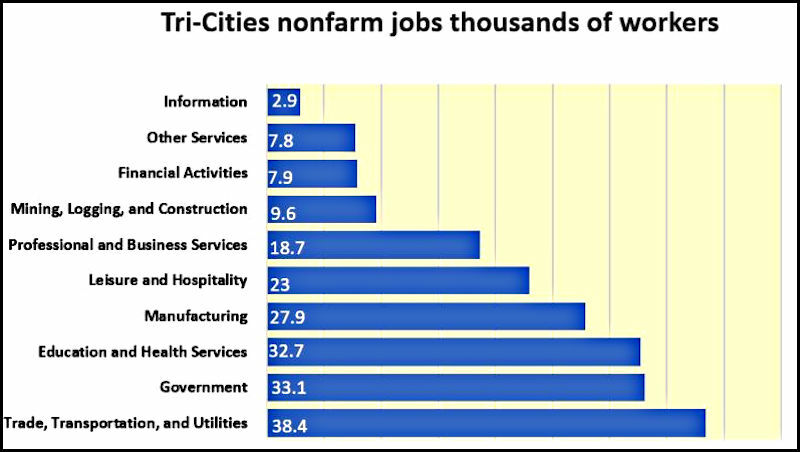 Although rates dropped, the economy produced 1,300 fewer nonfarm jobs in the seven-county region than it did in April. On the brighter side, May’s jobs total was 1,100 better than May last year. The job creation trend was down for the second straight month and only 0.4% better than May last year. The growth rate saw six months of 1% or better growth last year but began a contraction in July that bottomed in December. And when you drill down nonfarm jobs to the region’s two Metropolitan Statistical Areas (MSAs) May was a continuation of a very different dynamic from the regional big picture. 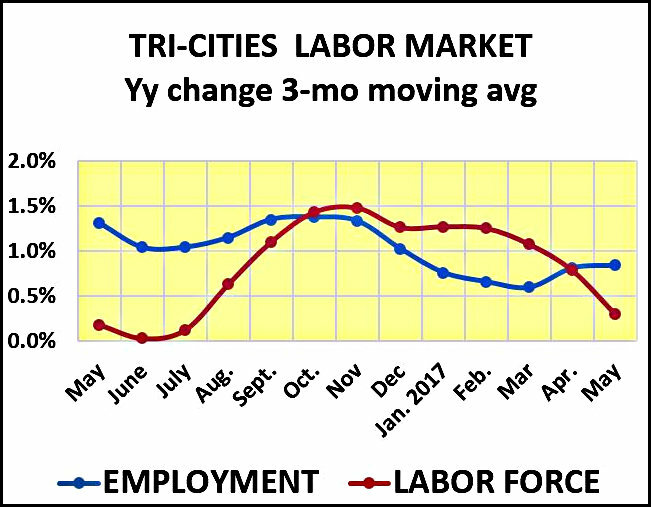 The Johnson City MSA job total was down 700 from April but continued its upward tracking on the more important year-over-year measure. That number was 1,300 jobs higher. It’s also noteworthy that the Johnson City MSA has more jobs in May than it did in May 2008, the year before the Great Recession hit the local economy. The picture is not so rosy in the Kingsport-Bristol MSA. May’s job count was down 600 from April and down 200 from May last year. It was the second straight month the jobs market has recorded a year-over-year contraction. Here’s the monthly capsule look at the local labor market conditions. Both the Payroll report for nonfarm jobs and the Household report for employment, labor force and unemployment are preliminary, non-adjusted numbers, so they will see adjustments when the June reports are issued. Nonfarm jobs 202,000, up 1,100 from May last year, 2,400 fewer than the May pre-recession benchmark. Employment – 217,310, up 1,874 from May last year, 20,018 less than the pre-recession high. Labor force – 225,020, down 774 from May last year, down 25,186 from the pre-recession high. Nonfarm jobs – 80,500, up 1,300 from May last year, 100 more than the May pre-recession benchmark. Employment -86,240, up 1,503 from May last year, down 9,972 from the pre-recession high. Labor force – 89,090, up 233 from May last year, down 12,270 from the pre-recession high. Nonfarm jobs – 121,500, down 200 from May last year, down 2,5,00 from the May pre-recession benchmark. Employment – 131,080, down 533 from May last year, down 9,028 from the pre-recession high. Labor market – 135,930, down 1,007 from May last year, down 12,948 from the pre-recession high. Employment – 11,060, up 17 from May last year, down 1,134 from pre-recession high. Labor force – 11,420, down 232 from May last year, down 1,466 from the pre-recession high. Employment – 29,990, up 531 from May last year, down 1,294 from the pre-recession high. Labor force – 30,900, up 72 from May last year, down 1,881 from the pre-recession high. Employment – 21,520, down 291 from May last year, down 697 from the previous post-recession high. Labor force – 22,260, down 240 from May last year, down 1,974 from its post-recession high. Kingsport is the only local city where employment reached then exceeded the pre-recession high but has declined from those 2013 levels.